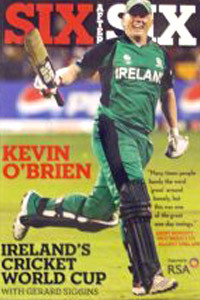 Who better to tell of the story of Ireland’s 2011 World Cup in India than Ireland’s master blaster, Kevin O’Brien, scorer of the quickest ever World Cup century in that tournament? In collaboration with Gerard Siggins, Kevin gives the reader an entertaining story of Ireland’s World Cup matches and starts with his own – and his brother Niall’s – background and how they came to play for Ireland and a little bit of Irish cricket history. O’Brien, of course, made his name with his outstanding century against England at Bangalore in a match which Ireland chased down 328 to record a major upset. I can testify for the quality of his innings having been one of the privileged few – and there weren’t many there: Ireland’s next match four days later against the hosts was full – to have been there and witnessed this remarkable match. Until he entered, the game had seemed to be taking a predictable course but O’Brien’s 63 ball onslaught turned it into a remarkable climax. He mentions that he was chuffed to receive an email from Matthew Hayden whose record he broke that evening. The book is written in an easy and chummy style. As his team-mates are generally referred to by their nicknames, I did sometimes wonder who I was reading about but, with an adequate knowledge of Irish players, it wasn’t that difficult to realise who Porty, Stilo, Joycey, Willo, Cusy, Whitey and Nialler were. Besides, the pen profiles near the front of the book were helpful not only for the nicknames but, more pertinently, the number of appearances each player had made and which teams they played for in Ireland. O’Brien comes from a fine sporting family. Being one of two siblings to represent his country, his father was also a prominent player at Leinster and it is easy to see where Kevin and Niall drew their inspiration and talent from. Their progress to the national side is well chronicled. Each match is detailed and, as he points out, Ireland, in Group A of the tournament ensured that that group was close to the end of the preliminary stages although they did not progress as they had in the 2007 World Cup in the West Indies. Kevin writes about the highs and lows, their pre-tournament preparation, their off the field times and, at the end of the book, he details his own career records as well as Irish records. With Ireland being amongst the top Associate nations, this book may give a little bit of further insight into Irish cricket as well as making an entertaining read on their exploits in the 2011 World Cup.